Grid Topper is as exciting a POWER bull as I've seen in a long time! He is as wide and deep chested as they come and is super wide based and thick when viewed from the rear. He possesses tons of body capacity and is extra deep flanked. I love his abundance of muscle mass, slick hair, and his clean sheath. This bull has a great big foot and a smooth, cool profile as well. Big testicles too. I have to believe that Grid Topper will produce tremendous progeny of BOTH males AND females the way he is flawlessly designed. 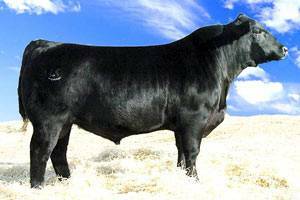 His dam is also the mother of TC Foreman, one Genex's better bulls. She is a really smooth patterned, nice uddered cow who clicked perfectly with the massive Gridmaker bull. She records 4 @ 114 NR and 3 @ 121 IMF ratio. 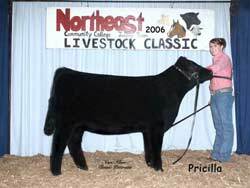 Grid Topper was the top gaining bull in TC's 2004 bull sale! This pedigree offers lots of mating flexibility to many of today's most heavily used sires, plus he'll inject a shot of power to your flatter muscled, finer boned females, while maintaining style. He's slick haired for the south and has an extra mellow disposition. TC Ranch used him heavily this past year, so you know they have confidence in him too! 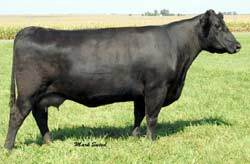 TC Pride 8067 is Grid Topper's dam. 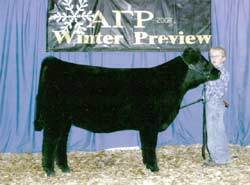 She was the $37,000 feature female at the 2006 TC Ranch Female Sale.